COMMENTS ON INDIAN COMPANY LAW: No Prior Approval is needed from NCLT or High Court for Merger for certain categories of Companies.-Fast Track Merger as per section 233 of companies Act 2013. 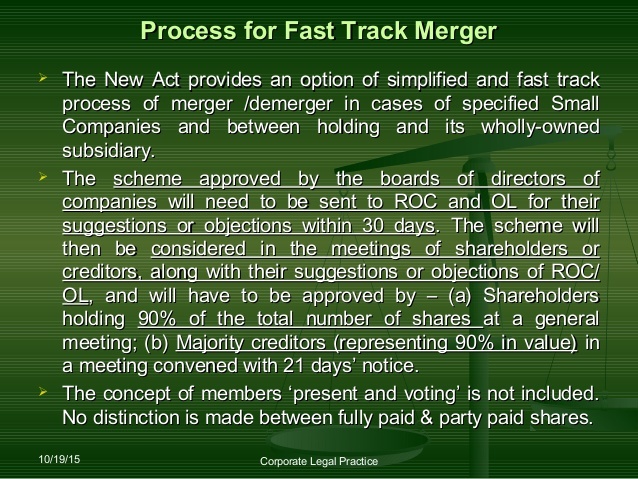 No Prior Approval is needed from NCLT or High Court for Merger for certain categories of Companies.-Fast Track Merger as per section 233 of companies Act 2013. No Prior Approval is needed from NCLT or High Court for Merger for certain categories of Companies. 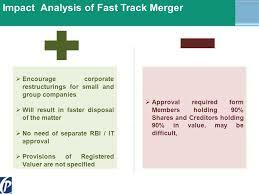 Fast Track Merger as per section 233 of companies Act 2013. 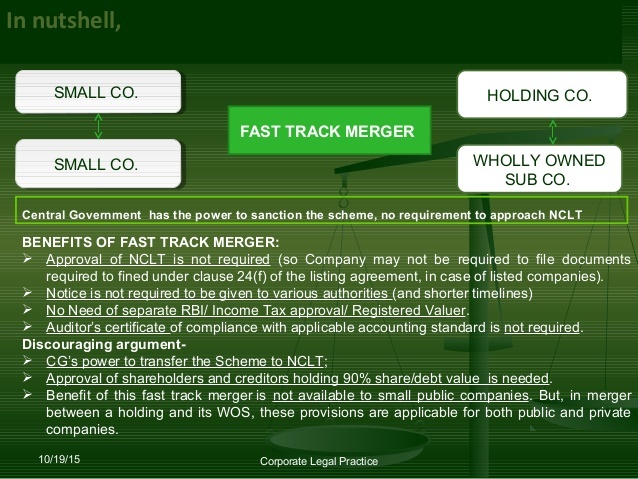 The Companies Act 2013 has incorporated the provisions regarding the merger of or amalgamation between two or more Small Companies or between a holding company and its wholly owned subsidiary company in a fast track basis thereby superseding the provisions of section 230 and 232 (ie National Company Law Tribunal (NCLT) route . b. Turnover as per last profit and loss account does not exceed 2 crores rupees or such higher amount as may be prescribed which shall not be more than Rs 20 crores. 3. Send Notice of the proposed Scheme of Amalgamation to Registrar & Official Liquidator inviting for the Objections and Suggestions from ROC & OL. 5 Obtaining consent of the Scheme by the creditors holding not less than 9/10 in value of total creditors.